After resigning from engineering company, I dedicated this year for learning about photography and videography focusly. Yes, I'm running photography and videography business. I always think the way to enhance my ability in those areas. I guess, we just have three options. The first one, taking formal/informal degree. Second, join photography or videography community. Third, working professionally as assistant or whoever of adorable photographer/videographer. I guess, I'll get first and second option in once. In the end of January, I went to free seminar in Conclave. I met with a guy and he said "Do you want to seriously learn about photography? Join Kelas Pagi. It's very insightful". I already knew about Kelas Pagi and I have joined workshop from Kelas Pagi in last October regarding Fashion Photography. I assume that Kelas Pagi just conducts free class/workshop/seminar. Nevertheless, it is such as school. If you want to join, you need to wait open recruitment anually, submit your portfolio and having interview. Then, if you are eligible, you can join that class. From my batch. 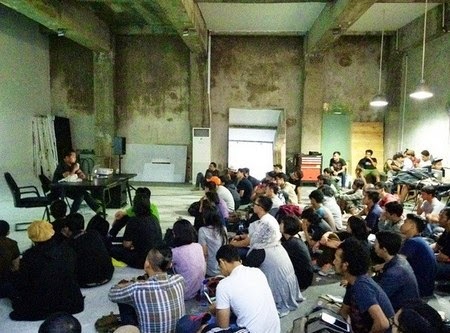 Over 200 applicants, about 90 were called to intervew and 50 are accepted as Student in Kelas Pagi Jakarta. Last week, I had orientation week from Monday to Friday. I needed to wake up at 5 a.m. Then headed to Third Eye Studio, Cipete at 5.30 a.m. Because the class is started at 6 a.m. I feel so lucky being student in here. Eventhough I just join for one week, but I guess this will be one-year-life-changing experiences for me, especially as professional photographer.